Taken from an article published in The Times Herald,October 5, 2012 Cross Country Marysville Invitational Boys TEAM RESULTS: 1. St. Clair A 24, 2. Port Huron Northern 54, 3. Cros-Lex 121, 4. Marine City 133, 5. St. Clair B 149, 6. Yale 174, 7. Marysville 191, 8. Richmond 240, 9. Capac 258, 10. Almont 277, 11. 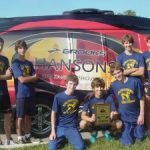 Reprinted from a posted article on http://bluewatersportsnetwork.com by Jim Whymer on September 29, 2012 Runners on the Port Huron Northern boys cross-country team recorded impressive times Saturday morning in the Hansons Invitational at Delia Park. The Huskies won their third invitational title of the season as they finished with 46 points, 31 ahead of runner-up Clarkston.